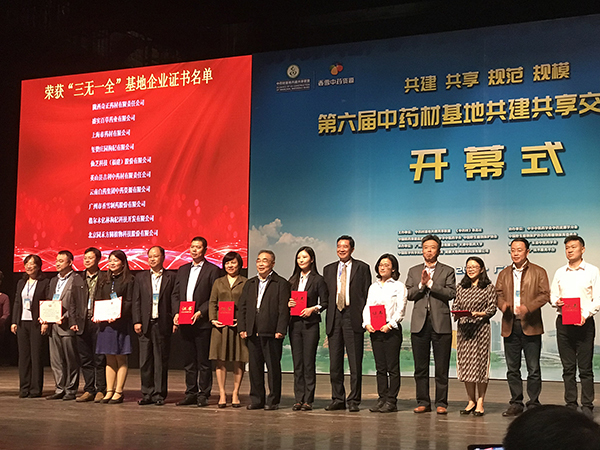 On November 4th, at the "Sixth Co-building and Sharing Seminar of the Traditional Chinese Medicine Base" held in Guangzhou, GANOHERB Organic Ganoderma Farm was awarded the "three nos and one whole" brand base in China. 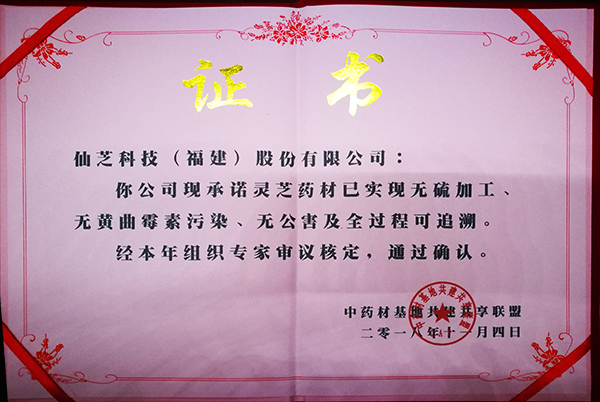 At the seminar, Academician Zhang Boli of the Chinese Academy of Engineering issued a certificate to GANOHERB and proposed, " We should develop vigorously the health food and pharmaceutical products of Ganoderma, one of the superior medicinal materials in TCM." The so-called "three nos and one whole" refers to "a kind of medicinal material cultivated in a pollution-free environment, processed with no sulfur-fumigation and produced with no aflatoxin contamination and its whole production process can be traced back and managed". Only 20 enterprises in China can win this honour. In view of GANOHERB's systematically standardized planting and processing procedures, its effective testing reports issued by the third party, its environmentally sound planting bases, and the organic certifications of China, the United States, Japan, and the European Union, the well-known experts in the industry unanimously affirmed GANOHERB to be determined as the enterprise with the title of [three nos and one whole" in China. Each place has its own way of fostering its own reishi mushroom . In order to ensure the safety, quality and efficacy of lingzhi from the source, GANOHERB insists on independently building its organic Reishi farms in Wuyi Mountain and at Minjiang River Source. For each base, the cultivation of Reishi Mushroom is strictly in accordance with GAP (Good Agricultural Practices) and the certification standards of China, the United States, the European Union and Japan. GANOHERB observes the natural growth principle of Ganoderma Lucidum. GANOHERB never uses non-natural substances such as pesticides, fertilizers, growth regulators, and genetically modified products. GANOHERB's entire industrial chain system can be traced back. Since 2006, GANOHERB's farms of Organic Reishi Mushroom has taken the lead in the industry. GANOHERB has passed the global GAP and organic certifications of four areas in the globe for 12 consecutive years. In 2015, GANOHERB was awarded the "Demonstration Farm of Edible Mushroom Cultivation and Processing Technology" by the UNIDO. In the annual organic test, GANOHERB's Organic Lingzhi products have to take more than 300 items of pesticide residues detection and the results are all "Negative". GANOHERB firmly believes that only a good base in a good environment can produce good raw materials and make good products. GANOHERB always puts the true quality of raw materials and the safety and reliability of products in the first place. GANOHERB has been devoted to makingLingzhi goods with higher quality for people in China and the world.